MaestroSafeTM products represent a new and safe class of nucleic acid stains for visualization of double-stranded DNA, single-stranded DNA, and RNA in agarose gels. The dyes are developed to replace toxic Ethidium Bromide (EtBr, a potent mutagen) ,commonly used in gel electrophoresis for visualization of nucleic acids in agarose gels. 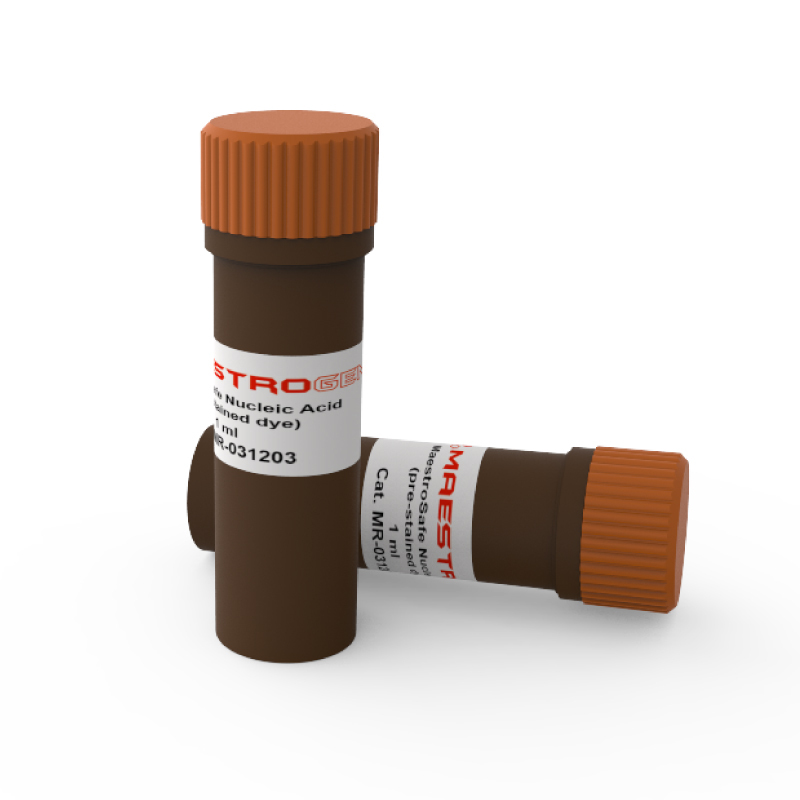 MaestroSafeTM Prestained with agarose With MaestroSafeTM pre-stained dyes, you do not need to do post-stain or pre-mix with agarose gel. All you need to do is mix MaestroSafe pre-stained dye with agarose in process of preparation and run electrophoresis normally. After the electrophoresis, view and document your results as you would do with EtBr staining protocols. 1. Prepare a 100ml agarose solution. 2. Heat solution until particles disappeared. 3. Add 1.5~2μl MaestroSafe pre-stained dye into solution and mix gently. 4. Let the solution cool down to 60-70℃ and cast the gel. 5. Load samples into well and perform electrophoresis. 6. View the results under traditional UV light after electrophoresis. 7. Or use non -hazardous UltraBright or UltraSlim LED transilluminator for not only good performance but also your health concerns. MaestroSafeTM pre-stained dye emits green fluorescence when bound to dsDNA and ssDNA and red fluorescence when bound to RNA.